I've superglued my thumb to my shoe. It's a very good thing I don't have a Container Store anywhere near me, because if I did, I'd be whoring myself out on the street corner every weekend for mo' money to purchase all the cool stuff they have available. Like these mini hot water bottles in three stupid cute patterns. And only $5! I need at least 20. I also need (need, mind you) the Pro/Con Notepad. I don't think I can make another decision in my life without it. Like, I don't know if I want to go home for lunch or go to Subway, but I think if I had the Pro/Con Notepad at my disposal I'd be able to work it out. While you're there you can also buy me some cute li'l key caps, paper soap sheets, and the Mr. Happy gel pack (which I'd give to Jake as his new mascot and inspiration). 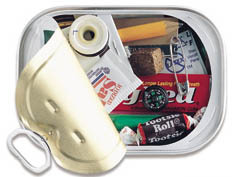 But I REALLY must have the Survival Kit in a Sardine Can™. Just look at it! It is chocked full of emergency medical supplies, nourishment, navigational aids, and more ... this compact, crush-resistant, watertight can fits perfectly in your backpack, tote, pockets, luggage, purse, glove box, or boat so it's convenient and ready when you need it. Inside you'll find over 25 items, all of which have primary and secondary uses. Go fish with the hook and line, find your way home with the compass, boil water in the can for your tea and sugar, use the first aid supplies to survive the wilderness. Even duct tape, matches, whistle, signal mirror, razor blade, fire starter cube, chewing gum, salt and a safety pin are included. And the list goes on. Dear LORD, people!! How have we lived without this??!? All of those times when I felt like my life was missing something, I thought the answer lied in spiritual enlightenment. But I was wrong - the answer lies in a sardine can filled with survival implements. Multi-tool includes a hammer, claw, long-nose pliers, wire cutter, knife, slotted screwdriver, serrated blade, file, Philips-head screwdriver, can opener, bottle opener and three sizes of nut driver. You are evil. I must now go to the Container Store and buy, buy, buy. I saw a lot of that stuff in either Budget Living or Real Simple, and I was dying over the soap sheets and the pro/con list. WAAAAAAAAAAAAAAANT! Oh, and also saw the nifty deodorant taker-offers and wanted those too. How ingenious! I just drooled my way through Container Store last night! I bought the sardine can and the To Do list, but sadly not the Pro/Con list. I also bought the computer rear view mirror which is very nifty. I installed it at work this morning. I wanted much, much more but had limited myself to the cash I had in my wallet. I just did that with these cute little shopping lists that I love with all my heart but feel stupid every time I order them. Ah, but we do have the hammer tool at the Container Store. I do not know if it is the same one, but we do have one of them. Let me know if you (or anyone) can't live without something and I'd be happy to pick it up for you, if we still have it in stock. The Stocking Stuffers are going quick-like right now.